Richard Burke have been designing and creating beautiful kitchens and furniture since 2001. 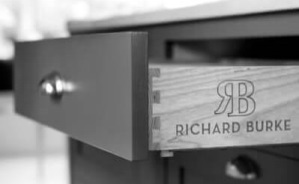 The company was set up to give rein to the skills and talent that Richard had honed and to allow his passion for designing and creating exceptional furniture to be fulfilled. Over that time we have developed into one of the leading bespoke kitchen design and manufacturing houses working in homes throughout the island of Ireland and on occasion further afield. We passionately believe in creating kitchens and furniture that stand the test of time using the best materials we can source within your budget. Pieces that will work just as well and look just as good as when they were first made in the many years to come. From first consultation, and throughout the design process we will seek to include you as much as you would like and your time allows. If you can?t devote the amount of time you would like to the project you can trust us to treat your kitchen as if it?s our own, to deliver to you a kitchen you can truly love. Our personal stamp of artistry and passion continues to be in every piece we produce. We constantly strive to maintain our genuine respect for past traditions but keep an eye on new technologies and trends in style, materials, techniques and finishes. See what our customers are saying about our product and service.